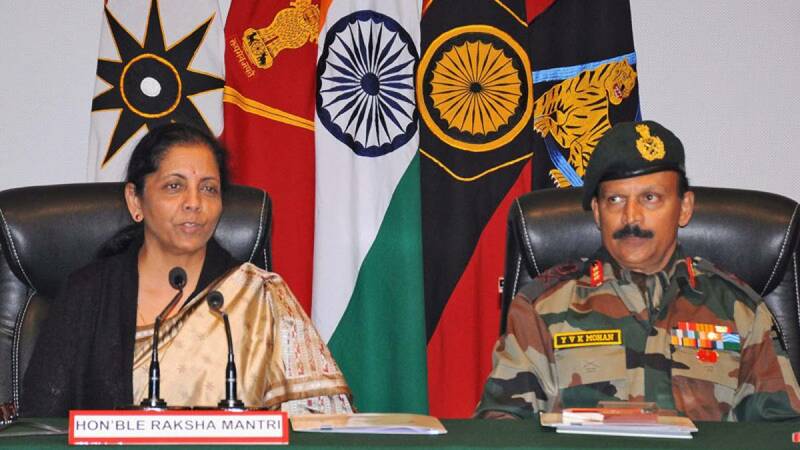 Jammu : Defence Minister Nirmala Sitharaman said on Monday that any action performed by the Army in its call of duty has to be seen in the relevant context and the government will stand by the force. Addressing the media after her visit to Sunjuwan army camp following a terror attack, she, asked several questions about the FIR against Major Aditya Kumar by Jammu and Kashmir Police in civilian killings during a firing incident in the Valley, said that the government was conscious that the Army, trained to tackle the external enemy, was working under duress in an internal security situation. Sitharaman said the the matter concerning Major Aditya Kumar was in the Supreme Court. "We have to see how it goes. We stand by our proud soldiers and army. And in the call of duty, if they have performed something, it will have to be contextualised," she said. "The Ministry of Defence, me as Raksha Mantri, and the Government of India under Prime Minister's leadership will stand by the Army. We shall not let anybody down," she said. She said the state has an elected government led by Chief Minister Mehbooba Mufti and the Central and state governments will have to work together to ensure that Army "is taken care of because they are fighting a very, very severe struggle". Sitharaman said she met Mehbooba Mufti and had a detailed discussion. On possibility of involvement of Rohingya Muslims in the incident, she said the Army will share all information with the Jammu and Kashmir Police.